Hallo allerseits! Ich benötigte dringend eine Geburtstagskarte (leider bin ich da immer knapp) für eine liebe Freundin und habe mir gedacht, ich nutze die Gelegenheit um euch zu zeigen, wie ich an personalisierte Karten herangehe. Zu zweit schenken wir unserer Freundin einen Kinobrunch und da musst natürlich eine passende Karte her. Ich wusste also, dass ich eine Art Kino darstellen und ein paar Köstlichkeiten integrieren wollte. Ich hab da sofort an die Shadow Box Card gedacht, das hätte aber mit den anderen „Brunch“-Motiven nicht so gepasst und daher habe ich mich für die „Scalloped Box Card Pop-Up“ Stanze entschieden. Ich wühlte mich durch meine Stempelsammlung und wurde bald fündig. Zuerst habe ich einige Motive mit Jet Black Lawn Fawn Stempelfarbe gestempelt und mit Copic Stiften koloriert. Ich habe Motive aus „Be hap-pea„, „Year Nine„, „Screen Time„, „Let’s Toast“ und „Sweet Friends“ gewählt – alle von Lawn Fawn. Nachdem ich alles gestanzt hatte, kamen noch ein paar Details mit einem weißen Gel-Stift dazu. Mit einer älteren Theater-Vorhangstanze von My favorite things (Hätte ich doch das Theater Add-On zur Shadow Box Card von Lawn Fawn gekauft 😉 ) habe ich passende Kino Vorhänge gestanzt. Die Stanze für das Glas mit Knöpfen von „Sewn with Love“ eignete sich toll für Kinositzen, wenn man sie verkehrt herum platziert. Neun dieser Sitze habe ich gestanzt. Alle Teile bekamen dann mit der Distress Oxide Farbe candied apple noch das Kino-rot verpasst. Für die Box Pop-Up Karte habe ich einen dunkelgrauen Cardstock gewählt und die einzelnen Rechtecke (im Set inkludiert) wurden ebenfalls mit candied apple eingefärbt. Der Spruch kam noch vom Year Nine Stempelset hinzu und dann konnte ich auch schon alles befestigen. Die Außenseite habe ich ebenfalls dekoriert, damit Platz für die Geburtstagswünsche ist. Hello everyone! I was in need of a birthday card for a good friend of mine (unfortunately I am always late with them) and I thought that it is a great opportunity to share a personalized card with you today. Another friend and I will invite to a cinema brunch where you first have a great brunch and then go to a movie together. I wanted a card which matches the present so I knew I wanted to create kind of cinema with some delicious food images. 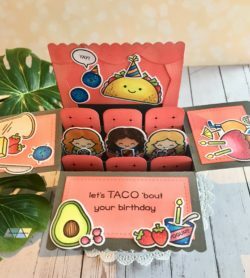 I thought about the shadow box card from Lawn Fawn but it wouldn’t fit with the food images and so I decided to use the „Scalloped Box Card Pop-Up“ die. I went through my stash and chose some Lawn Fawn sets. First I stamped a bunch of images with Jet Black Lawn Fawn dye ink and colored them with Copic markers. I used images from „Be hap-pea„, „Year Nine„, „Screen Time„, „Let’s Toast“ and „Sweet Friends“ all of them by Lawn Fawn. After diecutting everything I added some details with a white gel pen. With an older theatre curtain die from My favorite things (I should have bought the Theatre add-On of the Shadow Box Card from Lawn Fawn 😉 ) I diecut some matching cinema curtains. I used the die of the button jar from „Sewn with Love“ as cinema chairs (just place them upside down). All the pieces were ink blended with the Distress Oxide color candied apple. For the box pop-up card I chose dark grey cardstock and on the stitched rectangles I used again candied apple distress oxide ink. The greeting is from the Year Nine set. I also decorated the back of the card so that there will be some space for the birthday wishes. With personalized cards I always get my inspirations from the present or from hobbys of the birthday-person. After that I go through my stash and look for ideas/products which I can use for the card. The rest comes from alone most of the time.